These small lures were developed by Roddy in response to a demand for a reintroduction of a small lure we first made in 2004. At that time we made but a simple lure from a .44 ACP casing, and it proved popular for the crews catching live-baits in the south Atlantic at Ascension. In 2014, we reintroduced the .44, and a host of other baits too, ranging from the tiny 32 H&R to the massive .50Cal. What follows below is a brief guideline to all the lures; individual specs and colors can be found on the CONTENTS section to the right of this post. The .50 Cal is a hi-speed demon that needs nothing more than a hook to catch fish. Capable of being towed at over 20 knots, the 50 Cal will stay in the water no matter what. Fished flat off a rod-tip it will sit happily wiggling at up to 12 knots like a lipped plug, and from then on upwards at speed it becomes a tight-swimming baitfish that stays glued to the water. It is important to rig this lure so it is towed by a crimp or knot, not by the hook - which should stay loose and 'jingle' in the rear end. Approximately 4.5" long, the 50 Cal imitates a bunch of small offshore baitfish that you know most fish are normally stuffed to the gills with. 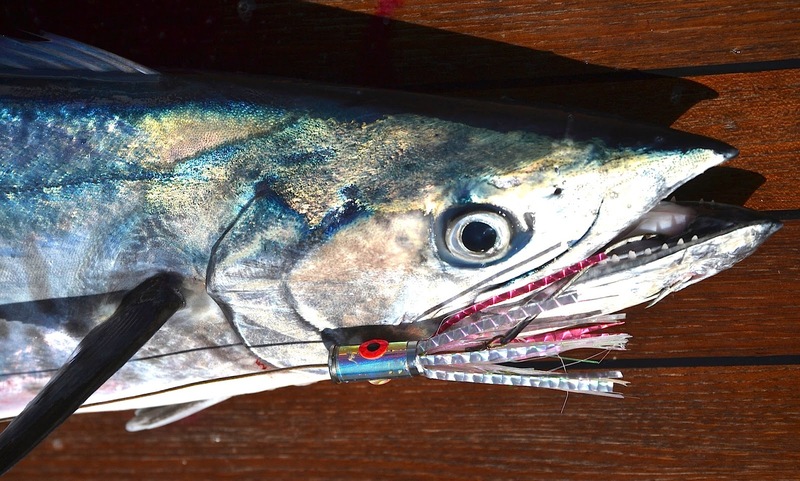 Thisis really one of the finest tuna, wahoo and mahi lures available. They're pretty 'bulletproof' too, and will catch fish till the day you lose them, whether they still have eyes and tape on them or not.